1866 marked the beginning of St. James Memorial Episcopal Church in Eatontown, New Jersey. Modest in size, yet impressive in impact, we came to be known as “The little stone church with the warm heart". Now, 150 years later, St. James is committed to preserving this important part of history, and with your help, spreading the message and action of “love thy neighbor” with a Commemorative Brick fundraiser to mark our 150th anniversary. 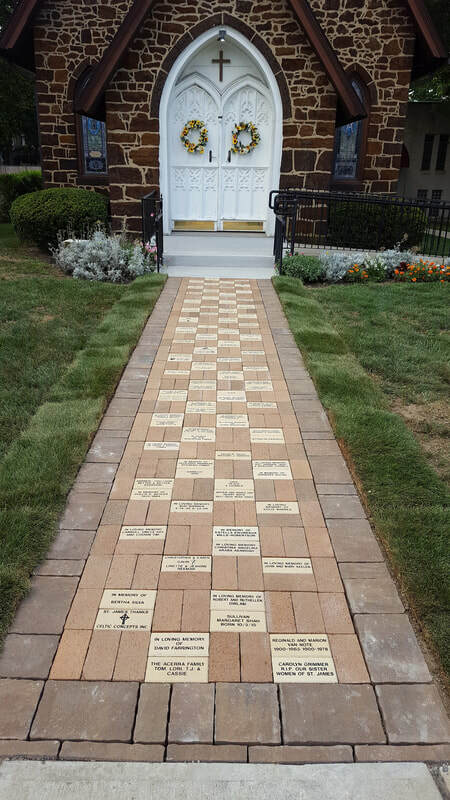 Your personalized bricks will be used to create a new walkway to the front of the church. Some of the proceeds will be used to reconstruct the crumbling front porch. ﻿Your Commemorative Bricks have a lifetime guarantee and will be replaced as needed to insure your message remains engraved in stone for a lifetime. Remember a loved one, a former member of St. James, honor your family or show the support of church, business or organization or maybe even provide an inspirational message. Recommended: 3 lines and 18 characters per line. Punctuations (period, comma, dash) and spaces count as a character. All letters will be in capitals and all text will be centered on the brick. To practice what you want on your brick and see what it would look like go to www.bricksrus.com/brick-creator select size 4x8, color Ivory, then place your order. St. James Memorial Church, 69 Broad St, Eatontown, NJ 07724 ("Brick" in the memo).